iPhone’s are definitely one of the very best, if not the best, smartphones currently available in the market. Millions of people all over the world use iPhone and wait anxiously for the release of latest iPhone models. While iPhone’s definitely come with some of the most innovative features that cannot be found in other smartphones, a common complaint about these devices is its operating system. 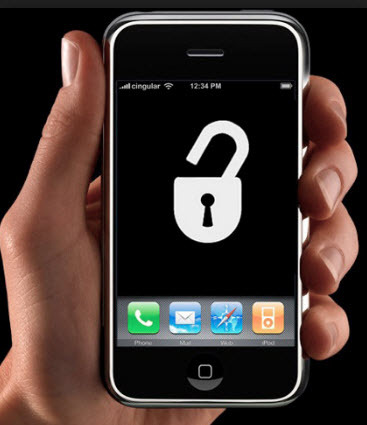 If we compare it with Android smartphones, the operating system of iPhone is pretty severely locked. As a result, they do not offer a lot of customization options that are very commonly available on cheapest of Android smartphones. Moreover, a lot of useful apps are simply not available in iTunes App Store due to the strict guidelines of Apple. So, is there a way out? Definitely Yes! Jail breaking your iPhone is an excellent way to break the operating system lock and then customize your device as much as you want and download the apps that you were not allowed to download before. And with so many different apps to choose from after jail breaking your device, you will definitely end up filling the storage of the iPhone. While some users might like to delete all the data from their iPhone and start afresh, some might only like to delete the data partially. iMyFone Umate Pro or iMyFone Umate Pro for Mac is an excellent software that provides you with this functionality. The software has a full-gamut of features with the help of which you can effortlessly manage the storage of jail broken iPhone. Let us have a quick look at how to erase jailbroken iPhone data with this software. 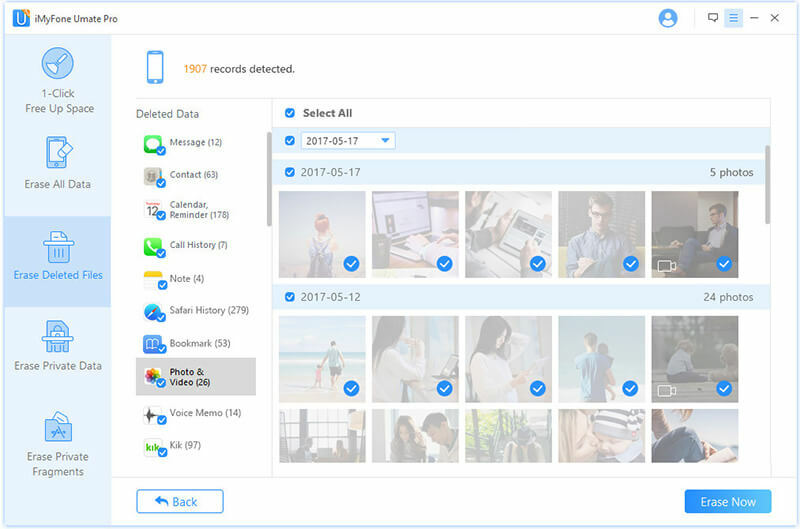 If you are looking to delete all the data from your jail broken iPhone, the Erase All Data feature of iMyFone Umate Pro can come in handy. There are varied scenarios, like giving the iPhone for repair, selling it, giving it to someone, errors related to storage, reduced performance of t device, etc. in which erasing all the content from the iPhone is an excellent option. While you do have the option of factory resetting your iPhone directly from the device, this option of erasing jailbroken iPhone is filled with many different drawbacks, like some users have complained that they were not able to activate their iPhone again after factory reset, some mistakenly deleted important content from the iPhone, and there have also been cases where the iPhone was dead after resetting. Needless to say, iMyFone Pro is definitely a much safer and simpler option. Majority of the users generally delete images, messages, videos, and other important files from the iPhone directly from the device. But do you know that the content that you directly delete from the iPhone can be recovered again? Yes, it is true! You can find several online tools with the help of which you can recover such deleted content. So, what if you have some important office-related data in your iPhone which you deleted directly from the device before selling it to someone? Isn’t there a possibility that the buyer might use such tools to recover all your important files again? Won’t you be in a lot of trouble for this? You definitely will be! 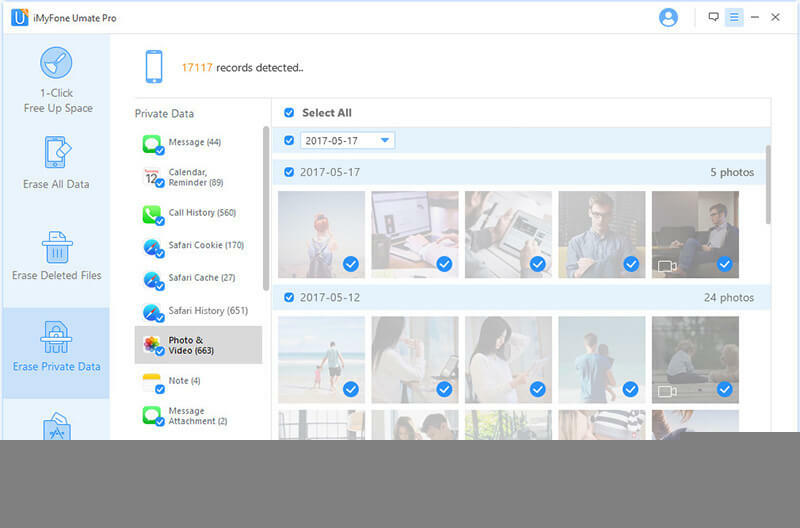 iMyFone Umate comes with Erase Deleted Files feature which allows you to permanently erase jailbroken iPhone from all such content. The files that you delete with this software can never be recovered with the help of any tool to provide enhanced security and privacy. Now what if you don’t want to delete all the content from your iPhone? Will you select every file individually and then delete them one by one? Just imagine how many days you will spend doing this! But iMyFone Umate is here for the rescue again. 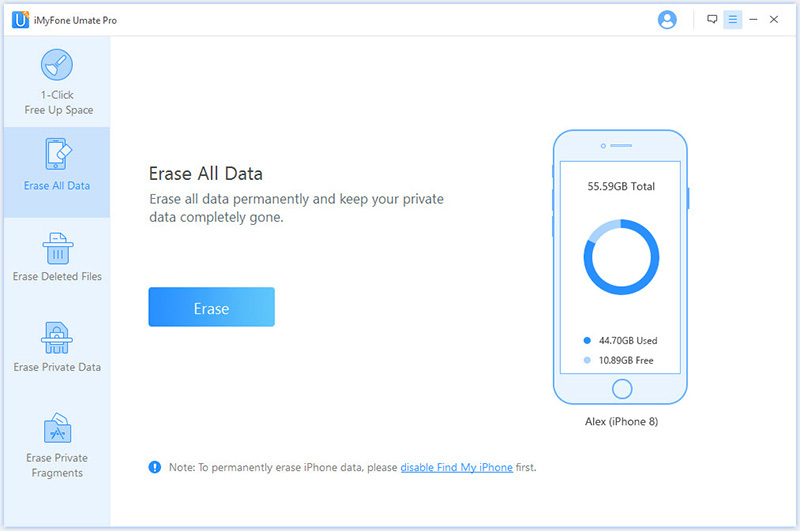 With its Erase Private Data feature you get to select the files that you want to delete and all the remaining files will remain safe in the jail broken iPhone. Simple select the files that you are looking to delete, press erase, and the software will delete the selected files instantly. 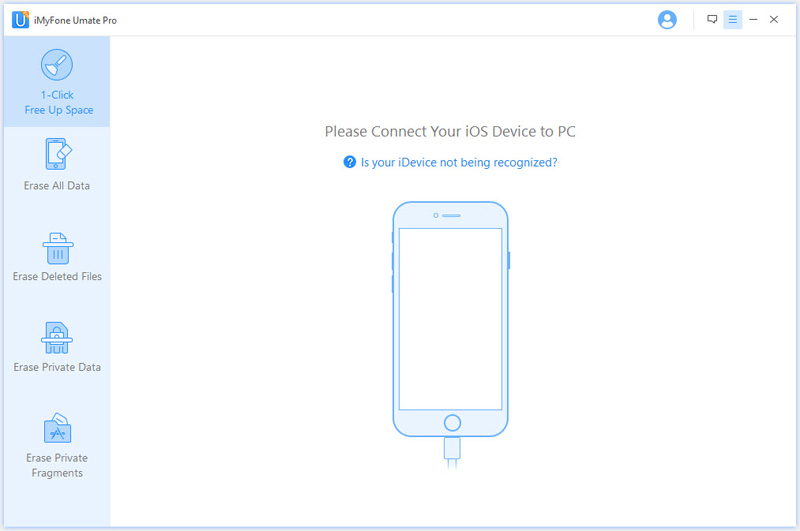 How to Use iMyFone Umate Pro for Erasing Jailbroken iPhone? Step 1: Download iMyFone software and then connect the jail broken iPhone to your computer. Step 2: Start the software and you will see all the different erasing options mentioned above. Step 3: Follow on-screen instructions and you will be able to instantly erase your iPhone according to your need. 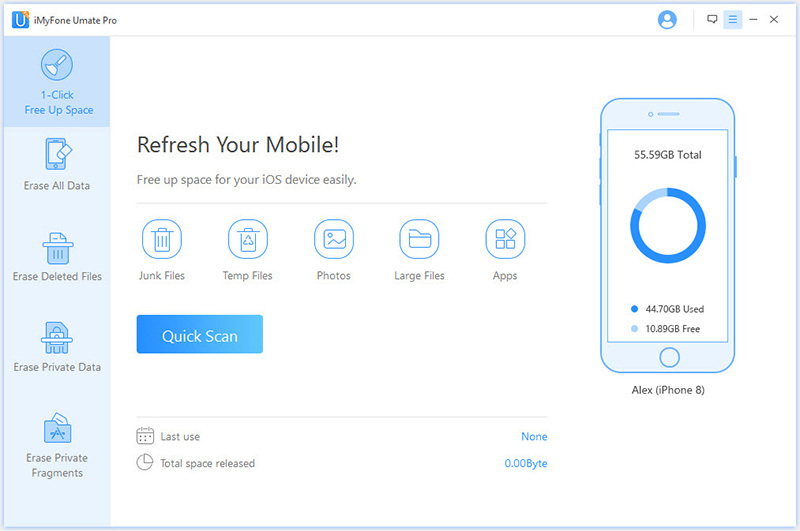 iMyFone Uamte Pro is an impressive software that provides you with enhanced capabilities to manage your jail broken iPhone’s storage. It is fast, efficient and simple, and you can also download its free trial version to test its features. So, what are you waiting for? Download today!